As this scene unfolded, it seemed very reminiscent of a situation where one makes a deal with the devil. After all, in a way these girls are surrendering their souls for the chance to have their wish come true. Tagged as Alien Nine's younger sister, Oooh Look at the cute animal mascot! 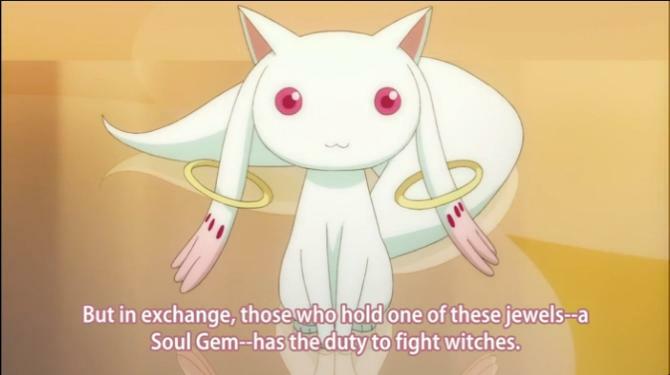 Kyubey’s smile honestly gives me the creeps sometimes. He’s adorable, yeah, but it almost seems like he’s smirking more than smiling. In a way, he reminds me of…I can’t remember its name, but one of the characters in Bokurano. If you’ve seen the series, you’ll know who I mean. No, but I am reminded of the cute starthings in Narutaru. With Episode 3, I have some really funny feeling towards the creature. When he comes into contact with a girl, he forces the girl to become a magical girl… only to get killed in the most gruesome way possible. On top of that, he so emotional-less. He doesn’t even move his mouth when he talks or have any fun… so serious compared to the ferret in Nanoha. So Kyubei has a deal with the devil… maybe? Episode 4 does not make it any better. I don’t think he can make any other face. He’s a very strange take on the mascot concept. And I keep hoping there will be a plushie. Yeah, maybe it’s one of those faces that split from the center and shows 8 scary mouths. Of course the 2 eyes will still be connected, by strange tentacles. I hope he has a creepy other form!